So, you’re considering a low-code or no-code platform. That’s great! There’s a lot of choice out there on the market and we are happy to guide you whether you are looking to bring one app to market at record speed, get ahead on the cutting edge of mobile technology or launch a full digital transformation. To build applications rapidly, you need a high-productivity and user-friendly platform. Between Betty Blocks, a no-code platform, and OutSystems, a low-code platform, there are some key differences depending on your goals, who will be using the platform, pricing, and features (we’ll try to be as neutral and objective as possible, but of course we are biased!). Do you know which platform is right for you? You may be experiencing difficulty innovating because your fresh business ideas fall to the end of IT’s backlog, and it takes too long to see results. Maybe your business is even suffering from the shortage of professional developers. Do you find yourself with ideas that are too big for your budget? 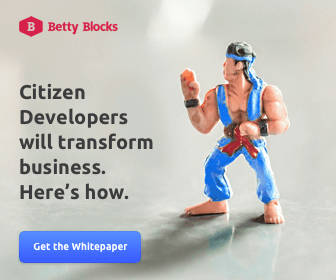 Betty Blocks No-code platforms like Betty Blocks close the gap between software needs and available developers by creating a new kind of developer: the citizen developer. This class of developers are eager to innovate, bring about new ideas and build quickly without needing to code. Because of the platform’s ease of use, a professional developer is not needed on every project. OutSystems On the other hand, low-code platforms like OutSystems requires knowledge of coding, specifically proficiency with .NET, to build applications. Professional developers are often OutSystem’s target audience. OutSystems in particular is ideal for teams of .NET developers to use to speed up project time to delivery. Because OutSystems does require a professional developer who can code, it does not address the developer shortage problem. While it allow developers to work 2x faster, there is a limit to the degree that a low-code platform can reduce IT’s backlog. OutSystems boasts a complex platform with many, many functionalities, and that is reflected in the cost--whether or not you need or use most of them. Pricing is also complex based it is based on the number of end users for the apps you build as well as hosting impact. Licensing fees may also change significantly, so when considering OutSystems, make sure you ask about pricing increases after the first year. To fully use the OutSystems platform, you will need to download Windows OS based software. This also means that you are responsible for installing all future updated versions of the platform yourself, and that you must migrate all of your applications to the updated version to avoid malfunctions or security risks. All developing with Betty Blocks can be done through visual modeling and a drag-and-drop interface of application logic, completely suitable for citizen developers. OutSystems requires proficiency in .NET to operate. With every new version of the platform that is released, users must update, test, and migrate all applications themselves or risk that they will not work on new versions. Betty Blocks is the first no-code platform to be ISO27001 certified. . In addition, since all customers automatically work from the same, and most updated, version of the platform, the most demanding customer sets the bar for platform security--and all users benefit from the same protections. Because the OutSystems platform is not fully cloud-based, users are responsible for downloading and installing updated versions, and migrate all applications. If they don’t, they will encounter major security risks. OutSystems uses an architecture of microservices which cannot function as complete high-level applications, making it impossible to re-use Blocks of code. As a consequence, the platform loses RAD functionality because microservices are not able to integrate as fluidly with backend and UI services. Don’t Just Take Our Word For It... Check out our demo video to see the platform in action. Or get up close and personal and try it yourself with a demo of your own.